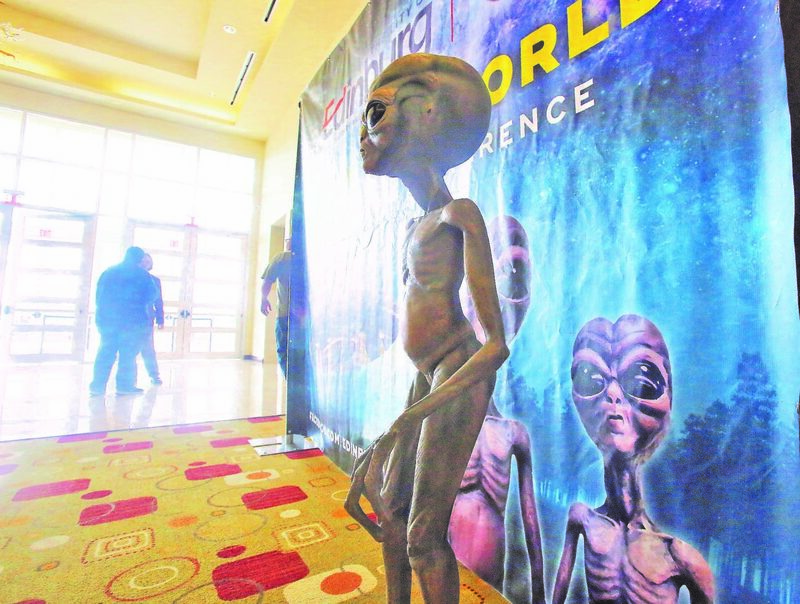 EDINBURG — Calvin Parker spoke in front of over 300 people here Saturday, telling the tale of how he was abducted by aliens in 1973. Though it may seem logistically unfathomable, or perhaps impossible, it certainly didn’t seem so to the attendees of the 8th annual UFO Conference held at the Edinburg Conference Center. According to Parker, he and a friend were fishing in the Pascagoula River that evening when he saw a beam of light hit the water, followed by a football-shaped “craft” moving toward him. He saw three creatures float out of the vehicle and move toward him. They were human-like, he said. In fact, one was slightly feminine; Parker joked that if he were intoxicated, he might have found her attractive. That creature then put their hand down Parker’s throat. He and his friend were escorted to the craft and hypnotized and physically examined by the creatures, then dropped off. With his presentation he showed drawings he made of both the craft and the creatures. Like several of the other speakers, he believes the government is involved in covering up the truth about UFOs. For years, Parker was silent. His friend, Charles Hickson, spent much of his life being very vocal about what allegedly happened to him until he died in 2011. Parker said he didn’t talk to Hickson much after it happened because he was upset that he contacted the media. In 2018 Parker published a book chronicling his experience, which follows many of the same details as Hickson. Since his book published, he said more people have come out as witnesses. Even with its unanswered questions, Parker’s story is thought to be one of the most backed-up in the country. Noe Torres, a local historian and author, organizes the event every year with the Edinburg Public Library. Eight years ago it would have been a lot more difficult to get someone like Parker to come speak. A chunk of the attendees are local, but many are from networks across the state and from throughout the world. Enrollment has grown throughout the years, Torres said.